Bleecker Street's Eye in the Sky registered the weekend's largest per-location average ($23,400) after taking in an estimated $117,000 from 5 locations in New York and Los Angeles. Eye in the Sky delivered Bleecker Street its largest per-location average for a platform launch to date, as the young distributor's previous per-location high-mark was the $17,364 average of last year's I'll See You In My Dreams (which opened with $52,091 from 3 locations). Eye in the Sky, which stars Helen Mirren and the late Alan Rickman, has received very strong critical reviews, as the film currently boasts a 95 percent Tomatometer on Rotten Tomatoes. Eye in the Sky will expand into additional locations next weekend and is scheduled to go into wide release on April 1. Roadside's Hello, My Name Is Doris also had a nice platform start this weekend, as the film took in an estimated $85,240 from 4 locations in New York and Los Angeles. That gave the Sally Field led comedy a per-location average of $21,310 for the frame. Hello, My Name Is Doris has also received strong critical reviews, as the film currently has an 89 percent Tomatometer on Rotten Tomatoes. The film is scheduled to expand into additional locations next weekend. City of Gold was off to a very solid platform launch with an estimated $64,000 from 4 locations in New York and Los Angeles. That gave the documentary featuring food critic Jonathan Gold a per-location average of $16,000 for the frame. The release from IFC Films' Sundance Selects label currently has a healthy 85 percent Tomatometer on Rotten Tomatoes. A24's Remember was off to a softer platform start this weekend with an estimated $20,000 from 2 locations in New York, for a per-location average of $10,000. Reviews for the Atom Egoyan directed drama thriller starring Christopher Plummer have been mixed, as the film has a current 68 percent Tomatometer on Rotten Tomatoes. Oscilloscope's Embrace of the Serpent expanded well with an estimated $186,007 from 75 locations, for a per-location average of $2,480. The critically acclaimed film from Colombia was up a healthy 164 percent over last weekend (when it was playing in 52 fewer locations) and didn't see its per-location average drop all that much in the process. Embrace of the Serpent has grossed $521,008 through 26 days of platform release. Oscilloscope plans to expand the film into approximately 30 more locations next weekend. Broad Green Pictures' Knight of Cups had a less impressive expansion with an estimated $90,135 from 36 locations, for a per-location average of $2,504. The Terrence Malick directed film starring Christian Bale was up 49 percent from last weekend upon expanding into an additional 32 locations this weekend. Knight of Cups has grossed $175,726 in ten days of platform release. The film is performing quite modestly given the involvement of Bale and Malick and has seen its potential limited by poor critical reviews. Sony Pictures Classics' The Lady in the Van continued to hold up well with an estimated $569,158 from 363 locations, for a per-location average of $1,568. The Nicholas Hytner directed film starring Maggie Smith was down just 21 percent upon playing in 66 fewer locations this weekend. The Lady in the Van has grossed a very solid $8.05 million in 59 days (and an additional one-week Oscar qualifying run back in early December) and is looking like it will pass the $10 million mark before the end of its run. Sony's Měi Rén Yú (The Mermaid) took in an estimated $150,000 from 82 locations, for a per-location average of $1,829. The Stephen Chow directed Mandarin-language fantasy was down a sharp 60 percent upon playing in 24 fewer locations this weekend. Měi Rén Yú (The Mermaid), which is the highest grossing film ever in China, has grossed $2.99 million through 24 days of platform release in North America. Sunday Update: Disney's Zootopia continued to lead the box office with ease this weekend with an estimated second weekend take of $50.0 million. The critically acclaimed 3D computer animated film from Walt Disney Animation Studios was down just 33 percent from last weekend's debut; a sure sign of just how strong word of mouth is for the film. Zootopia registered the sixth largest second weekend performance ever for an animated film (behind only 2004's Shrek 2, 2010's Toy Story 3, 2007's Shrek the Third, last year's Inside Out and 2004's The Incredibles). The film has grossed a very impressive $142.62 million through ten days of release. That places the film 29 percent ahead of the $110.31 million ten-day start of 2014's Big Hero 6 (which fell 38 percent in its second weekend to gross $34.66 million). Given its strong word of mouth, the approaching Easter holiday and the relative lack of competition for family audiences it will face throughout the rest of March and early April, Zootopia should continue to hold up very well going forward. Paramount's 10 Cloverfield Lane opened in second place with an estimated $25.2 million. The J.J. Abrams produced thriller starring Mary Elizabeth Winstead and John Goodman opened in line with its wide ranging expectations and performed well with its modest price tag in mind. 10 Cloverfield Lane, which has been referred to as a relative to 2008's Cloverfield, opened 37 percent below the $40.06 million three-day start of Cloverfield, but wasn't expected to deliver that type of debut this weekend. 10 Cloverfield Lane performed more similar to last year's The Visit, which opened with $25.43 million. 10 Cloverfield Lane opened with $9.00 million on Friday (which included a sizable $1.8 million from Thursday evening shows), increased 8 percent on Saturday to gross $9.70 million and is estimated to decline 33 percent on Sunday to take in $6.50 million. That places the film's estimated opening weekend to Friday ratio at 2.80 to 1. The audience breakdown for 10 Cloverfield Lane skewed towards male moviegoers (60 percent) and heavily towards moviegoers over the age of 25 (68 percent). 10 Cloverfield Lane has received strong critical reviews and currently boasts an encouraging 86 percent audience score on Flixster. The film didn't go over as strongly on CinemaScore, where it received a B- rating. Deadpool claimed third place with an estimated $10.80 million. The Ryan Reynolds led blockbuster antihero film from Fox stabilized nicely this weekend, as it was down 35 percent. Deadpool continues to pad its total as the highest grossing release of 2016 thus far with a massive 31-day gross of $328.08 million. The film is running an exceptional 51 percent ahead of the $216.74 million 31-day take of 2014's X-Men: Days of Future Past. Deadpool is likely to hold up well again next weekend, before Warner's Batman v Superman: Dawn of Justice enters the marketplace the following week on March 25. London Has Fallen followed closely behind in fourth place with an estimated $10.67 million. The action thriller sequel from Focus and Gramercy was down a sizable, but understandable 51 percent from last weekend's debut. In comparison, 2013's Olympus Has Fallen fell 53 percent in its second weekend to gross $14.15 million. London Has Fallen has grossed $38.85 million in ten days. 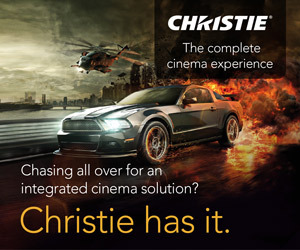 That is in line with expectations but is 29 percent softer than the $54.89 million ten-day take of Olympus Has Fallen. Paramount's Whiskey Tango Foxtrot rounded out the weekend's top five with an estimated $4.60 million. The R-rated comedy starring Tina Fey held up nicely this weekend, as it was down 38 percent from last weekend. Whiskey Tango Foxtrot has grossed $14.57 million in ten days. The film is still performing below expectations and is running 35 percent behind the $22.44 million ten-day take of 2014's This is Where I Leave You (which fell 40 percent in its second weekend to gross $6.89 million). The Perfect Match debuted in sixth place with an estimated $4.15 million. That gave the romantic comedy from Lionsgate and Codeblack Films a very solid per-location average of $4,486 from a relatively modest 925 locations. The Perfect Match started out with $1.56 million on Friday, increased 11 percent on Saturday to gross $1.73 million and is estimated to fall 50 percent on Sunday to gross $0.86 million. That gives the film an estimated opening weekend to Friday ratio of 2.66 to 1. The Perfect Match currently has a 62 percent audience score on Flixster. Meanwhile, Focus' The Young Messiah and Sony's The Brothers Grimsby were both off to very poor starts this weekend. The Young Messiah opened in seventh place with an estimated $3.40 million, while the Sacha Baron Cohen led The Brothers Grimsby followed in eighth place with an even softer estimated start of $3.15 million. Both films opened below their already modest respective expectations. The Young Messiah appears to be going over better with moviegoers, as the film received an A- rating on CinemaScore and has a current Flixster audience score of 71 percent, whereas The Brothers Grimsby received a B- rating on CinemaScore and has a current Flixster audience score of just 55 percent. Saturday Update: Paramount reports this morning that 10 Cloverfield Lane made a strong debut in second place with $9.0 million on Friday, including Thursday night's $1.8 million haul. That's generally in line with The Visit's $9.2 million opening day last fall and marks a strong start for the Bad Robot release from first-time director Dan Trachtenberg and producer J.J. Abrams thanks to strong early word of mouth. The "spiritual sequel" currently boasts an 87 percent Flixster score on top of its 91 percent Rotten Tomatoes mark, leaving the "B-" CinemaScore as the only indicator of any mixed word of mouth. Based on a mid-teen millions production budget, the film is already a success and will hope to enjoy healthy legs for its genre. 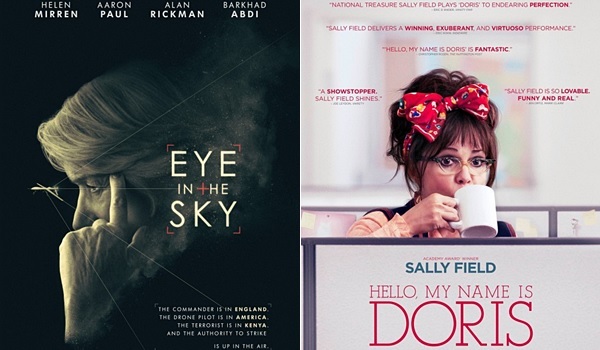 BoxOffice projects an opening weekend around $23.3 million. Meanwhile, Disney's Zootopia held onto first place yesterday with $12.023 million -- impressively off just 38 percent from opening day last week. That gives the animated smash hit an eight-day tall of $104.6 million as it paces 25 percent ahead of Big Hero 6 (which eased 49.5 percent from its first-to-second Friday). Look for a huge sophomore frame of $52 million this weekend, easily landing in first place again. London Has Fallen slipped 60 percent from opening Friday last week to $3.023 million yesterday, giving it $31.2 million in the domestic bank so far as it heads toward a likely $10.4 million second frame. Deadpool was just behind it with $3.0 million on Friday, sending it to $320.3 million domestically as it aims for $10.7 million this weekend. The Perfect Match exceeded two other new releases this weekend by debuting fifth place yesterday with $1.56 million -- doing so with just 925 theaters. Its opening weekend should net around $4.0 million. The Young Messiah proved to be front-loaded to Thursday night showings where it earned a strong $475,000, but tallied $1.38 million in all once counting Friday's numbers. It is likely that church-related group sales skewed the abnormally high Thursday night figure. By comparison, Risen earned $4.02 million in its first day including a $430,000 Thursday night showing. Young Messiah should score around $3.3 million this weekend. Lastly, The Brothers Grimsby is living down to expectations with just a $1.2 million opening day on Friday. That falls below the $1.8 million first day of last year's Unfinished Business despite posting a near-identical Thursday night debut of $240,000 (versus Business' $250,000). Opening weekend looks to be around $3.0 million. Friday Update: Sources report that 10 Cloverfield Lane grabbed a strong $1.8 million from opening night Thursday at over 2,500 locations. By comparison, last fall's The Visit took in $1.02 million on its way to a $25.4 million opening weekend. However, there's clearly a lot of excitement from fans of the original Cloverfield and producer J.J. Abrams for this spiritual sequel, while it remains to be seen whether or not casual audiences are still intrigued by the mysterious premise after an eight-year gap between chapters. Further complicating matters is the fact that reviews are outstanding so far, ultimately leaving most comparison points null and void. For now, the potential weekend debut could land anywhere between $24-35 million, likely somewhere in the center of that range. Meanwhile, The Young Messiah also got off to an excellent relative start last night with $475,000 -- besting Risen's $430,000 Thursday night just last month. Strong reviews and a late marketing campaign surge are bringing out faith-based crowds for the second of four major Christian films opening this winter/spring. A weekend over $10 million now looks possible, if not higher than Risen's $11.8 million opening frame. Lastly, The Brothers Grimsby earned a grim $235,000 last night. That's under the $250,000 haul of last year's Unfinished Business, which debuted to just $4.8 million over its three-day weekend. The Perfect Match is also set to open this weekend, although no opening night numbers were reported at the time of publishing. 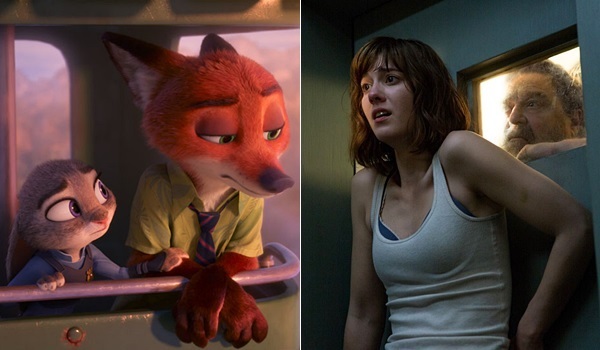 Disney's Zootopia is expected to easily repeat in first place this weekend ahead of what looks to be a strong second place opening for 10 Cloverfield Lane. Follow BoxOffice on Saturday morning for more concrete weekend estimates based on official Friday estimates from the studios. Walt Disney Animation’s Zootopia scored a huge $83.1 million this weekend internationally up 25% from the prior weekend taking its overseas total to $288.7 million. Holdover business was blistering in China where the film set a single day animation record on Saturday and grossed $56.5 million for the weekend (local sources estimate $60M). China’s total is now $109 million and Zootopia will undoubtedly pass Kung Fu Panda 3 ($149M) as the highest-grossing film of all-time there. Other top territories for the toon are: France ($23.8M), Russia ($20.6M), South Korea ($14.7M), Mexico ($14.0M), Germany ($13.0M), Italy ($11.4M), Spain ($10.9M) and Argentina ($6.3M). Australia and Brazil open next weekend. The Divergent Series: Allegiant kicked off its overseas run in 45 markets this weekend, debuting with $26.7 million. Top grossing markets for the third installment in the YA series were France ($5.0M), Russia ($3.5M), Brazil ($2.8M), ($2.7M), Spain ($1.8M), and Italy ($1.8M). Gods of Egypt earned an additional $26.4 million from 73 overseas markets this weekend thanks in large part to China's $20 million debut. 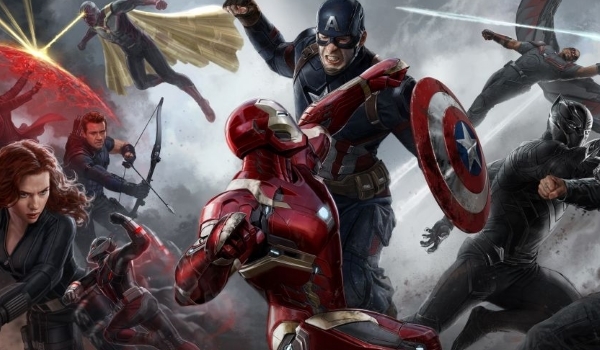 The overseas total stands at $80.5 million and the worldwide total is $107.8 million. Hail, Caesar! grossed an estimated $3.8 million in 43 overseas territories this weekend, raising the international total to $23.8 million and the worldwide total to $53.5 million. Italy opened in 2nd place with $1.1 million, while the UK held with $1.3 million for a 10-day total of $4.7 million, keeping back with No Country For Old Men and Birdman. The Brothers Grimsby opened in 13 new markets this weekend including Russia and Germany and grossed an estimated total $3.2 million from over 2,600 screens in 34 total markets. The international cume to date is now $11.2 million and the worldwide cume is $14.35 million. Russia earned $0.93M and Germany debuted with $0.56M. Disney's Zootopia took in $3.91 million on Thursday to lead the daily box office for a seventh straight day. The critically acclaimed 3D computer animated film from Walt Disney Animation Studios was up a healthy 5 percent over Wednesday's performance. 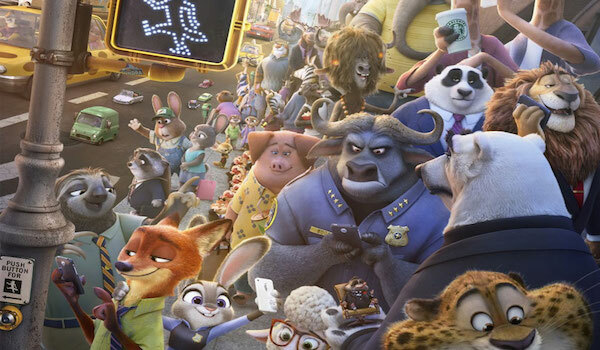 Zootopia was easily the week's top film with a very strong seven-day start of $92.62 million. That was 15 percent ahead of the $80.30 million seven-day take of 2014's The LEGO Movie and 22 percent ahead of the $75.64 million seven-day start of 2014's Big Hero 6. Fox's Deadpool was up one spot from Wednesday to move into second place on Thursday with $1.36 million. The Ryan Reynolds led blockbuster antihero film was up 2 percent over Wednesday and down a very solid 35 percent from last Thursday. 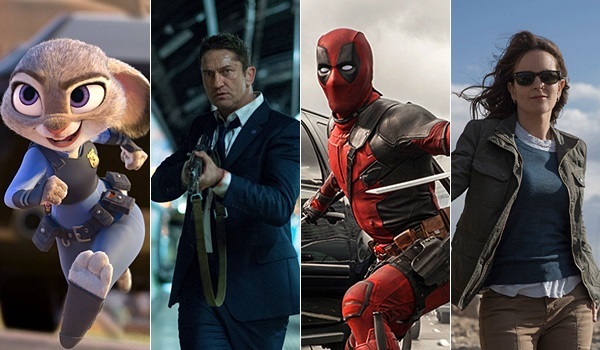 Deadpool placed in third for the week with a weekly take of $22.52 million. That represented a 45 percent decline from the previous frame and brings the film's four-week total to an exceptional $317.28 million. London Has Fallen fell one spot from Wednesday to finish in third with $1.35 million. The action thriller sequel from Focus and Gramercy declined 5 percent from Wednesday. London Has Fallen took second place for the week with a seven-day start of $28.12 million. That was in line with expectations, but was also 31 percent below the $40.74 million seven-day launch of 2013's Olympus Has Fallen. Paramount's Whiskey Tango Foxtrot rounded out its first week of release with a fourth place take of $0.565 million. The R-rated comedy starring Tina Fey was down 3 percent from Wednesday. Whiskey Tango Foxtrot finished in fourth for the week with a seven-day start of $9.97 million. That was a bit below expectations and 36 percent softer than the $15.55 million seven-day start of 2014's This is Where I Leave You.